Chefs from the world-famous cooking academy share their expertise for achieving culinary wizardry. Through clear instructions and over 1,000 illustrations, this volume presents the finer points of kitchen knowledge, from selecting proper utensils to successful methods for preparing fish and shellfish, meats, poultry, dairy and eggs, vegetables and cereals, starches, and fruits. Brimming with expert tips and solutions for all aspects of fine cooking, this is an essential kitchen resource for those who are passionate about preparing food. 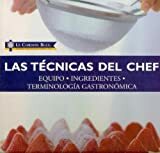 Los maestros cocineros de la escuela conocida en todo el mundo le ofrecen a lo largo de este libro todos sus conocimientos técnicos, desde la selección de ingredientes y la selección de los utensilios hasta las técnicas necesarias para conseguir un dominio absoluto en la cocina. Con instrucciones claras y mas de 1,000 imágenes, ilustra métodos para preparar pescado y mariscos, carne, aves y cazas, huevos y lechería, legumbres y cereales, frutas, y aromatizantes. Es un recurso esencial para los que son apasionados acerca de la preparación de los alimentos. Le Cordon Bleu, founded in Paris in 1895, is the world's most famous culinary academy for professionals and amateur enthusiasts.